This past weekend I got a new to me Hurom juicer used from just around the corner here in Ajax off of Kijiji. By buying it used I saved about $100. The juicer runs about $353 (plus taxes and shipping if you are ordering online). So it is definitely worth scouting out the local Kijiji ads for people who have given up on juicing. There are basically 3 kinds of juicers: centrifugal, masticating and then the Hurom which is a class of its own. My old juicer was a centrifugal juicer that shreds your fruits and vegetables with tiny blades through a basket. It relies on a completely different technology. With the centrifugal juicer, the fast spinning basket flings the pulp into a holding bin – the draw back is that there is a lot of waste and often a lot of juice left in the fruit and veggie fibers. So many times you push a lot of fruits and veggies through the centrifugal juicer to get a small amount of juice. During the shredding your fruits and veggies are also exposed to oxidation causing loss of the nutritional quality of the juice and may also damage some of the phytonutrients. A masticating juicer (or twin gear juicer) squeeze fruits and veggies through a single or twin gear process that extracts more juice than centrifugal juicers. 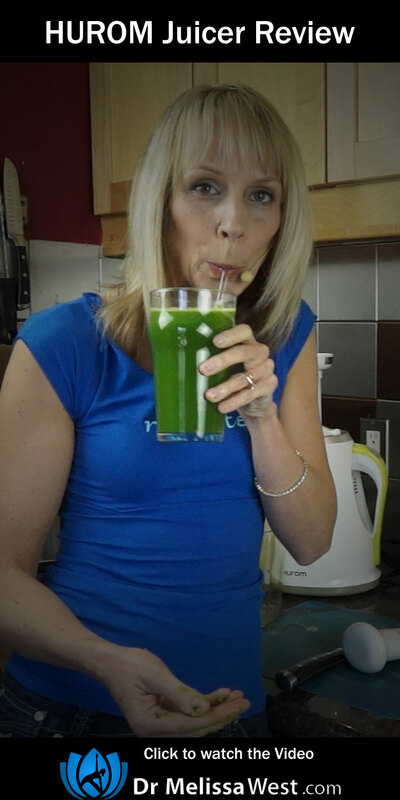 They are great for greens and wheat-grass and have been the favourites of serious juicers for years. The problem is they are slow, they take up a lot of room on the counter-top and they take a long time to assemble, clean and reassemble. They are also a lot more expensive than centrifugal juicer. It makes nut milks! Yay no more straining through nut milk bags! Hurom juicer is a “slow juice” technology developed by the Hurom company. This technology uses “triturating” technology that “rubs” the juice out of fruits, vegetables, nuts and seeds. This means you don’t lose any nutrition through oxidation or damage the phytonutrients with blades. You can actually see a centrifugal juice beside a Hurom juice – the colours are richer – it even looks more nutrient dense. Even though it is a “slow” juicer – it actually juices just as quickly as my old centrifugal juicer. 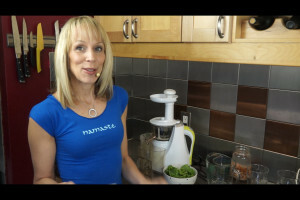 It is pretty easy to clean – much easier than I imagine a masticating juicer would be – my centrifugal juicer was pretty easy to clean too. Although the ability to run water through this baby does pretty much all the work for you!